Managing high performers who discard company policies in favor of their own rules can be challenging. A manager at a recent leadership training shared an issue she was having with one and asked for my advice on managing high performers who are super productive and prefer to call the shots. In this case, the employee takes frequent breaks instead of adhering to the company break policy. The manager has had multiple conversations with him and nothing has changed. This is causing stress and is taking up too much of her time. She doesn’t want to fire him because he is a top producer. Sound familiar? When managing high performers who make their own rules, there is more than one solution. Here are three. What would you do? Maintain status quo. Continue to discuss the issue and hope for the best. Hold the team member accountable. Put them into the company disciplinary process if they won’t improve. Eliminate the break policy. Do we really need one? Maybe everyone can self-manage their breaks. When managing high performers who make their own rules, it’s important to weigh the impacts of what not following the rules is having on the other team members. As you might guess, the rest of the team isn’t very happy with the rogue rule breaker and it’s causing a morale issue. Poor morale isn’t just a state of mind. It’s a state of productivity. I suggested she calculate how much this situation is decreasing the productivity of the other employees on the team to see the real impact. Let’s use a fictional example to walk through the math. Assume you have a team of 7 customer service reps who work in a call center. The expectation is that each person will answer 50 calls per day. The top producer makes 55 phone calls a day, 10% above average. Let’s assume, very conservatively, that the poor morale accounts for a 10% decline in productivity resulting in 45 phone calls per day for the rest of the team. If removal of the top performer improved morale by 10% your net increase would be 25 calls per day. This example only reflects the improvement of the daily numbers. Other benefits include reduced employee turnover and an increase in trust. High-trust organizations outperform low-trust organizations by 286% according to a study cited in The Leadership Challenge. That number is significant. A strong factor for developing a high-trust organization is fair treatment for all employees. In this specific case, fair treatment means holding everyone accountable to a stated policy. Picking and choosing who gets a pass on policy compliance is dangerous territory. It will very difficult to hold anyone accountable. Hold the team member accountable. Get rid of the break policy. I recommend Option 2. 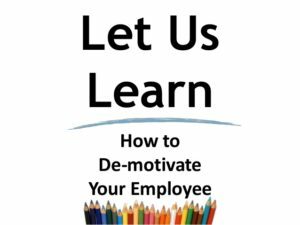 Be clear about what’s expected, what the consequences are if not the expectations aren’t met, and let the employee decide what they want to do. The problem with Option 1 is the morale of the rest of the team will continue to deteriorate, productivity will continue to suffer, and the reputation of the leader is negatively impacted. Option 3 isn’t ideal because the policy is there for a reason. Eliminating policies in order to avoid having difficult conversations sends the wrong message. This isn’t to say policies shouldn’t be reviewed, they should be, just not as an alternative to dealing with problems head on. In the end, decisions for the best way to handle employee issues should be based on facts and focused on long-term impacts. Easy? Not at all but it’s simple when you follow some basic guidelines: have clear expectations, track performance, provide feedback. Liz Uram helps leaders get better results through clear communication!